Herter is a historian and philosopher of science and genetics, and a driving intellectual and creative force behind, as the New Yorker writer Jill Lepore puts it, “the only show on television where you’ll hear the line,‘Enjoy your oophorectomy!’” Throughout production for each of the three seasons, Herter has been integral to both the science and the story. She’s responsible for the references to Sacred Geometry and Buckminster Fuller, and she also, according to her longtime friend Graeme Manson, who with John Fawcett is one of Orphan Black’s creators and showrunners, “reads all the drafts and watches all the episodes and then it runs through her incredible brain.” She offers insights intended to refine and deepen the themes and the narrative, showing how science interacts with society, and discouraging simplistic dualities — pointing out, for example, “that religion and science are constantly intermingled throughout history.” We may have a “richer understanding of the science of heredity” than the eugenicists of the early 20th century did, but the idea of reengineering ourselves, of creating “perfect” people, is still very much with us. 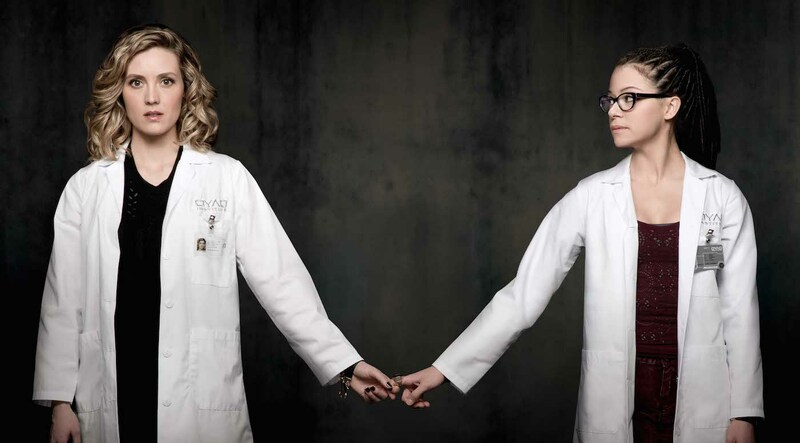 Herter is so embedded in the fabric and ideas of the show that colleagues call her “Real Cosima,” to distinguish her from Cosima Niehaus, the clone character she inspired. Like the show’s characters, like so many of us in this culture that seeks to decode our genes in an effort to predict and guide our futures, Herter is interested in the meeting of science, genetics, and chance. Like the show’s characters, like so many of us in this culture that seeks to decode our genes in an effort to predict and guide our futures, Herter is interested in the meeting of science, genetics, and chance. Orphan Black, which just wrapped its third season, drops the viewer in the middle of a world—roughly contemporaneous with ours—where biotech and patents are urgent flesh-and-blood questions. With its multiple clone protagonists, the series is a narrative hothouse environment for examining the nature of individuality and the relative strength of genes and environment in shaping who we become, and also the possible contingencies of our new biotech world. “Women are often, throughout history, reduced to their biology, and marginalized because of that biology,” Herter has said. How might these tendencies manifest, the show asks, if a group of women were literally engineered as an experiment? So far the answer has been alarming, smart, and funny; it’s knowing and stealthily feeling. Without being heavy-handed, Orphan Black is wise about the mysterious nature of human life itself. In the show’s very first episode, the conwoman and former orphan of the title, Sarah Manning, watches a woman who looks exactly like her, except expensively, impeccably coiffed, walk off a subway platform in front of an oncoming train. Then Sarah does the thing her life up to now has taught her is the kind of thing she would do: she scoops up the woman’s bag and flees the station. She takes over the woman’s life, planning to impersonate her just long enough to drain her bank account. Soon, though, Sarah learns that she’s a clone, with potentially innumerable identical sisters, who turn out to be very different from each other. Cosima Niehaus (“Clone Cosima” to Herter’s Real Cosima) is a scientist studying experimental evolutionary developmental biology. Alison Hendrix is a high-strung suburban perfectionist mom. Beth, the woman who killed herself, was a cop. And Helena is the product of a fundamentalist clone-hating cult that doesn’t seem to have given her a surname. Meeting these women, Sarah’s sense of possibility begins to expand. Maybe she’s not destined to be someone who steals things and leaves. When I met Herter in the lobby of my Minneapolis hotel, each of us was surprised to find the other diminutive and approachable. She didn’t particularly remind me of any of the characters on the show, not right away, but like her clone counterpart she radiated warmth, generosity, and intelligence, and also reserve. She wasn’t accustomed to being someone people want to profile. In fact, she’d only recently started watching TV. (She didn’t really grow up with it, and never developed the habit until she needed to for the show.) How she came to be involved in Orphan Black—to be indispensable from the very beginning—was, like her mastery of the history and philosophy of genetics itself, a matter of talent and intellect meeting chance. Herter’s parents married in San Francisco, migrated east and into Canada, through Ontario, where she was born, and then kept going north, into the Northern Territories, where she grew up. Her parents were “draft-dodging hippies,” she says, “pretty committed alcoholics” who eventually divorced. Her life at home was unpredictable. 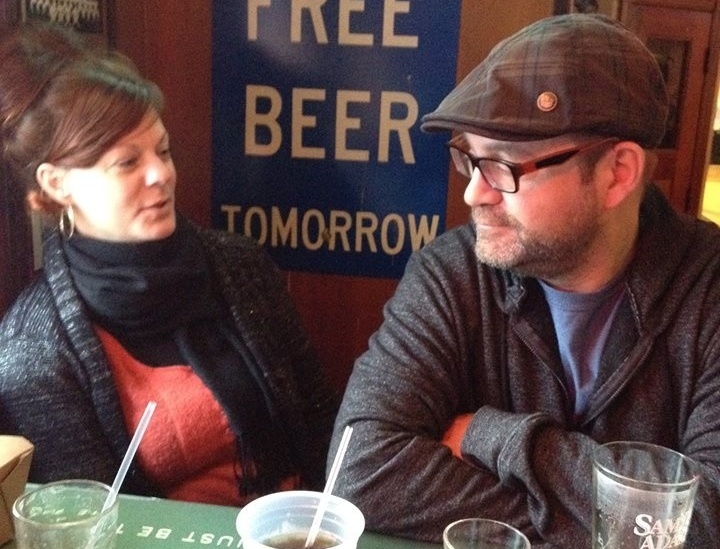 Siblings — she had many, through both parents, some of whom she barely knew — were in and out. Her mom was more likely to use homeopathic remedies or crystal therapy or to consult an astrological chart than to call a doctor. Moving to Vancouver, she took an administrative job with good benefits, but quickly became bored with the 9-to-5 life. She was drawn to philosophy and started downloading syllabi off the internet, working her way through the readings for classes. Eventually, frustrated by her inability to master this material on her own to her satisfaction, she decided to go back to school. Her education didn’t take a direction, though, until she went to a professor’s office to understand why she’d done well on a paper she’d been nervous about, a paper about a political philosopher “I didn’t really enjoy reading and I wasn’t sure that I understood.” After they’d discussed the paper, the professor, Dr. John Beatty, looked at her and said, “What about you? What are you interested in? Forget about the class; who are you?” She found herself fighting tears as she told him about the reading she’d been doing on her own. As she finished telling this story, over lunch at the hotel restaurant, I had goosebumps on my arms, and Herter’s eyes were full and glistening. For a very awkward second, I thought we both might start bawling.“I don’t usually cry when I’m sad, but when something is beautiful I do,” she said, explaining how much Darwin still means to her now, how much respect she has for his bravery in publishing ideas that were so dangerous and revolutionary in his day. 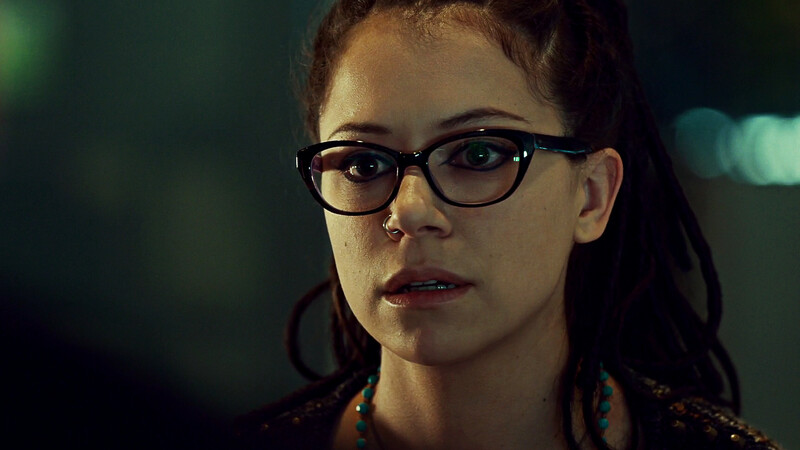 By this time, Herter did remind me of Clone Cosima, and sometimes of Sarah, too. Now, months later, it’s hard for me to watch the show and not see a little of Herter in Maslany’s acting. As it happens, John Beatty’s work is also concerned with chance, and he offered to read Bergson with Herter in independent study. He became her mentor and then her best friend, encouraging her through the Master’s program in Vancouver and toward a doctorate. Until last June she was pursuing a PhD at the University of Minnesota in the History of Science, Technology and Medicine. She saw her work on Orphan Black and her work in the program as complementary, but that wasn’t the vibe from the department as a whole. Weary of the pushback and the student loan debt, she left school. Now she’s devoting herself to Orphan Black and to her own writing. Herter explained that she was living in his apartment — back in Vancouver — at the time. Her own place had been badly water-and-smoke damaged in a fire, but she’d stayed despite warnings from city inspectors because her cat had gone missing and because she was a student waiting tables, too broke to move anywhere else, with a Master’s thesis due. Some days later, after the cat had turned up, Manson happened upon her smoking in the backyard behind the ruined building (all the floors above her ground-level flat were burnt-out shells) and insisted she move into his place. In lieu of rent, he said, she could give it a fresh coat of paint, work she’d sometimes done for money. As promised, he was mostly out of town that summer, but when he was around he began to talk with her about Orphan Black over drinks on his front porch. They were amazed and excited to discover how much their interests were converging. It’s a diverse group, one that soaks in her knowledge and her philosophical probings and filters them into the storyline not to shock — though Orphan Black does shock — but always muddying simplistic understandings of identity and sexuality in ways that feel true and alive. The third season of the show featured an army of male clones (Castor to the female clones’ Leda) and genomic plot twists galore. The lead-up to the season finale involved a hunt for “the Castor original,” the male clones’ original donor, that upends viewers’ expectations in every direction and has Herter’s fingerprints all over it. “The epigenetic implications themselves are just mind-blowing!” Clone Cosima says, in the final minutes of the finale. And sometimes she’s needed urgently for story. Just before our second meeting, a crucial prop fell through at the last minute — suddenly a fee, way over budget, had been tacked on — and everyone was rushing to try to figure out how to adapt the story on a couple hours’ notice. Herter read scientific journals on the fly, fielded suggestions, and gave the best workaround advice she could. Although Herter was consistently open with me about her life and generous with her time, her insights, and her stories, she said she doesn’t ordinarily talk about herself. I can believe it. Throughout our time together, she kept shifting the conversation to the book I’m writing about ancestry, suggesting things I should read, archives I might want to visit, conferences I could attend. Gratefully, and a little guiltily — this was not the purpose of our meeting! — I scrawled down everything she said and then gently returned her to the subject of herself. Before she agreed to meet with me, she asked some questions over the phone about my interest in her work and in the show, and I mentioned that I originally started watching Orphan Black because of my book project. It’s a wide-ranging thing, about my own family and genealogy, in part, but more broadly a layperson’s exploration of the science and superstition of inheritance, about our efforts to understand the extent to which who we are depends on genes, or environment, or some epigenetic blend of the two, and the extent to which we ourselves determine who we become. These questions are personal — and emotional — for most of us, and as I told Herter I’ve pondered them a lot over the years because I came into being through a kind of failed eugenics project. My parents married not for love but because they thought they would have smart children together. This was my father’s idea, and over the six months they dated he persuaded my mother of its merits. In the end, as an adult, I was a terrible disappointment to him, and he blamed my mother’s genes. Confiding these things to Herter didn’t seem likely to make any lists of journalistic best-practices tips, especially once I started writing and realized they had became inextricable from this profile of her. My own background and the particular contours of my interest in her work were a subtext of our conversations, and at times even a subject that explicitly ran through them. During our time together, I sometimes felt as though Herter were interviewing me as much as the other way around, and I had the sense she’d interact with anyone else in this same companionable way. She’s interested not just in how philosophers like Darwin think about the kinds of questions Orphan Black raises, but in the perspectives of the actors she works with, the students she’s taught, the layperson writer such as me, and, really, everyone. These questions are personal — and emotional — for most of us, and as I told Herter I’ve pondered them a lot over the years because I came into being through a kind of failed eugenics project. As she often does in interviews, Herter repeatedly emphasized that she’s not a scientist. “I don’t have the authority of that kind of knowledge.” She’s drawn to exploring contingency in science, how “things have congealed and become what they are,” to “understanding evolution and the concept of chance that plays into it that seems so controversial.” Our universal scientific principles arose because of the questions people asked: “History matters. You have to put these ideas in their historical context, just like you have to put your own ideas in your own historical context.” And “science is political. Science has always been political,” she said, citing Richard Lewontin, a Marxist evolutionary biologist who’s “very interesting in terms of what we can actually use genetics for and he’s also an anti-determinist. People want things to be determined. They really want X to cause Y. They really want that. I am a complete anti-determinist.” At the same time, “I don’t think we are entirely socially constructed. I think that to some degree we are, by language, by culture, by gender expectations and religion. We are. But there is also – I think there is a genetic component to everything in biology.” We just don’t understand what those components are. Orphan Black is very good at depicting these kinds of complication. Aldous Leekie, at one point a bigwig in the show’s shadowy Dyad Institute, is in some ways what his name suggests: a character straight out of Aldous Huxley’s Brave New World. In other ways, as Herter says, he is — or at least sees himself as — a kind of humanitarian. After we parted ways, I ended up feeling as though I couldn’t profile Herter properly unless I read and mastered all of her recommendations — an impossible task. I flew home and came down with a two-week flu, and in my feverish state I binged on books from the reading list she’d given me. Of all those I read then or since, the one that fascinated and horrified me most was the acclaimed geneticist George Church’s Regenesis: How Synthetic Biology Will Reinvent Nature and Ourselves, co-written with Ed Regis. Church is a professor of genetics at Harvard Medical School, a professor of Health Sciences and Technology at both Harvard and MIT, and a founder of the Wyss Institute for Biologically Inspired Engineering. His Personal Genome Project makes the sequenced genomes of Esther Dyson, Steven Pinker, and many other people publicly available online and Church aims to attract a total of 100,000 participants, “a veritable MixMaster blend of humanity.” He has done as much as any other single person to shape synthetic biology as it exists now and as it could exist in the future. To give you a sense of where he’s coming from: Regenesis begins with a prologue titled, “From Bioplastics to H. sapiens 2.0.” The book is visionary, formidable, terrifying, and sometimes, to put it kindly, facile; in it, Church advocates total diversity, even diversity not capable of existing on our planet right now. Regenesis makes Orphan Black and everything it’s reckoning with seem more than feasible — it makes the concerns of the show seem like matters of great urgency. As Herter said in our interviews, synthetic biology is already proceeding on many fronts. I was vaguely aware of some of these developments, but Church describes them in mesmerizing fullness in the pages of Regenesis. To list just a few of his examples: We’ve engineered E. coli to produce diesel fuel. We’ve revived an extinct species (the ibex), though the baby “lived for only a few minutes before dying of a lung condition.” And we have altered the genomes of mice, mixing in human DNA, for tailored research into treatments for cancer, cardiovascular disease, autoimmune disorders, neurobiological disorders, and much more. After reading Regenesis, out of curiosity I tried to look up all variations of these mice, all the uses to which they are being put, and I couldn’t find a comprehensive list — in part because it’s possible, if you’re a researcher, to have the mice tailor-humanized just for you. Whatever discussion exists in the scientific community about how the mice themselves might be affected by, for example, having human brain cells, seems to focus only on the ways we’ve succeeded in making the mice more like us. I’ve never felt more like I was living in a dystopian novel than when I researched the price of humanized mice and tweeted about it and ads began to follow me around the Internet, cropping up amid solicitations for dresses and hand towels. The mice are often cheaper in bulk, if you’re in the market. Early in Regenesis, when it serves the arguments he’s making, Church approvingly invokes the argument that science fiction “‘has a way of pointing to the future.’” Later in the book, though, he calls Karel Capek’s seminal “R.U.R.,” in which biological machines “take over the world and wipe out the human race,” “a tiresome and overworked scenario if there ever was one.” Can it be overworked if it’s a real possibility? Even Church acknowledges that there “are no fail-safe fail-safes in biological lab work.” In all our efforts to engineer and guarantee our own futures, we are opening biology — our own and other beings’ — up to chance in ways it never has been before. The science of biology is, in the broad sweep of human history, still very new. As Herter points out, it emerged as a discipline only in the 1800s, the same century that gave us the word “scientist.” Our understanding of biological “inheritance” is an even more recent development. In A Cultural History of Heredity, the scholars Staffan Müller-Wille and Hans-Jörn Rheinberger note that “until well into the nineteenth century, a medical tradition dating back to antiquity” held that the “constitution and character of individuals” depended on six “non-natural things” — “nutrition, environment, rest, exercise, bodily excretions, and psychological states” — and seven natural things — “spirits, elements, humors, and organs,” and “functions, capacities, and temperament.” Ideas about heredity were fragmented in different disciplines. Then came Charles Darwin, with his groundbreaking theory of evolution, and his half-cousin, Francis Galton, who invented eugenics, the idea of improving humans through strategic breeding. And it wasn’t too long before Gregor Mendel, with his pea plants and charts of dominant and recessive traits, was established as the father of modern genetics, and everything came to seem much more clear-cut. Even now all the money flowing into biotech, and the appearance of books like Regenesis and John Harris’s Enhancing Evolution: An Ethical Case for Making Better People, shows that our eugenical impulses are alive and well. Genetic research is invaluable — it’s advanced our treatment of disease by leaps and bounds — but sequencing the genome was supposed to tell us everything our DNA controls, everything it dictates, and it hasn’t done that. It hasn’t even come close. While the emerging science of epigenetics, of the ways our genes change over the course of our lives and especially of the question whether and when we can pass those changes to our offspring, is inchoate and hotly disputed, we would be foolish not to acknowledge that our view of hereditary genetics is, at best, through a glass darkly. Not to mention, in the context of all the genomic tinkering we’re doing, arguably obsolete. As Herter says, Orphan Black is “proposing certain things in terms of dystopia that are not untrue.” In every direction the show raises questions that we can’t answer — that we may never be able to answer — but that we are long overdue in pondering. Not only through the mind, through the rubric of this enterprise we call science, but through the heart. Maud Newton is writing a book about the science and superstition of ancestry. Her work has appeared in Harper’s, the New York Times Magazine, Narrative Magazine, The Awl, Granta, Bookforum, and many other publications. She won the Narrative Prize for fiction in 2009.